North America Before the European Invasions tells the histories of North American peoples from first migrations in the Late Glacial Age, sixteen thousand years ago or more, to the European invasions following Columbus’s arrival. Contrary to invaders’ propaganda, North America was no wilderness, and its peoples had developed a variety of sophisticated resource uses, including intensive agriculture and cities in Mexico and the Midwest. Written in an easy-flowing style, the book is a true history although based primarily on archeological material. It reflects current emphasis within archaeology on rejecting the notion of “pre”-history, instead combining archaeology with post-Columbian ethnographies and histories to present the long histories of North America’s native peoples, most of them still here and still part of the continent’s history. Kehoe’s excellent North America Before the European Invasions merges archaeology and history demonstrating that American history did not begin in 1492 with European contact. Kehoe expertly interweaves much evidence demonstrating that colonial Europeans did not begin to manage an American wilderness but appropriated organically millennia-old manipulated landscapes by indigenous peoples. With inimitable style, Alice Kehoe entices, provokes, and challenges us [or readers] to engage with a history of America that foregrounds, not marginalizes, the indigenous peoples of this vast land. The result is a fuller, more critical and highly compelling history of Native North America that does much to challenge the outdated, often biased, and sometimes racist accounts of these First Peoples that have hung on for far too long in textbooks and popular culture. 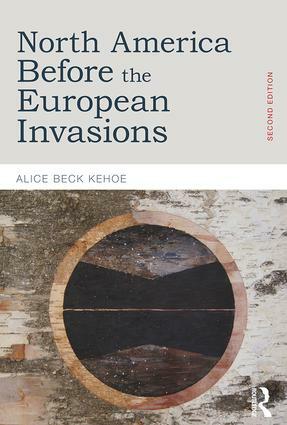 Alice Kehoe has provided readers interested in the long history of Native North America an excellent introduction to the complex and fascinating archaeology of America before European invasions. In a highly readable and engaging manner Kehoe's approach to archeological knowledge is critical but also responsive to the concerns and interests of all scholars working in this continually unfolding research area. The reader will find that Native North American history before European colonization continues to define how we see ourselves as residents of a continent that has a rich past, a dynamic present, and an exciting future. Kehoe's account assures us the future of Native North America has the potential for promoting greater understanding between Indigenous First Nations and the newcomers to Native North America. "North America Before the European Invasions delivers a wonderfully jargon-free general history of North America prior to contact. It simultaneously eases the reader into substantial historical summaries, while also challenging the reader to think bigger and ask better questions. Kehoe’s narrative style is an accessible format for non-academics and the broad-stroke summaries of times and geographies are a bookshelf necessity for archaeologists. With some supplementary materials, Kehoe’s volume would make a suitable introductory text to courses on North American History." - Amanda J. Butler, University of Illinois at Urbana– Champaign.